Our mouths are full of bacteria. Hundreds of different types live on our teeth, gums, tongue and other places in our mouths. Some bacteria are helpful. But some can be harmful such as those that play a role in the tooth decay process. Tooth decay is the result of an infection with certain types of bacteria that use sugars in food to make acids. Over time, these acids can make a cavity in the tooth. Throughout the day, a tug of war takes place inside our mouths. Our teeth go through this natural process of losing minerals and regaining minerals all day long. When a tooth is exposed to acid frequently — for example, if you eat or drink often, especially foods or drinks containing sugar and starches — the repeated cycles of acid attacks cause the enamel to continue to lose minerals. A white spot may appear where minerals have been lost. This is a sign of early decay. Tooth decay can be stopped or reversed at this point. Enamel can repair itself by using minerals from saliva, and fluoride from toothpaste or other sources. But if the tooth decay process continues, more minerals are lost. Over time, the enamel is weakened and destroyed, forming a cavity. A cavity is permanent damage that a dentist has to repair with a filling. A space inside the tooth called the pulp chamber houses the root canal system and pulp — the living tissue that keeps the tooth vital (alive). The pulp includes blood vessels, nerves and connective tissues, and, during childhood, creates the surrounding hard tissues of the tooth. Endodontic treatment (“endo” – inside; “dont” – tooth), commonly known as root canal treatment, is needed when the pulp becomes inflamed or infected. The causes could be deep tooth decay, repeated dental procedures on one tooth (replacing a large filling, for example), or traumatic damage such as a crack, chip or even a root fracture.Gum disease can also give rise to root canal problems necessitating root canal treatment. Any of these issues can result in acute inflammation of the pulp, which causes swelling and pressure inside the tooth (that has nowhere to go), leading to tooth pain and, eventually, irreversible damage to the pulp. Once the pulp dies, the pain may subside initially, sometimes to return as an acute (painful) infection spreading into the periapical tissues (“peri” – around; “apex” – end), particularly the bone. It could also become a chronic (long-standing) infection with symptoms ranging from mild to severe. Once the pulp is infected or dead, if left untreated, pus can build up at the root tip in the jawbone, forming an abscess. An abscess can destroy the bone surrounding the tooth and cause pain. Whatever the cause of root canal or pulpal disease, root canal or endodontic treatment will be necessary to save the tooth. 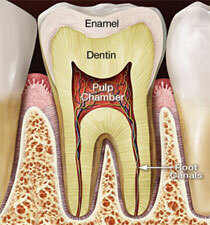 Root canal treatment is the removal of the tooth’s pulp, a small, thread-like tissue in the center of the tooth. 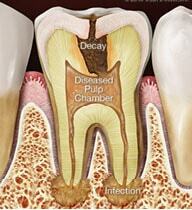 Once the damaged, diseased or dead pulp is removed, the remaining space is cleaned, shaped and filled. This procedure seals off the root canal. Years ago, teeth with diseased or injured pulps were removed. Today, root canal treatment saves many teeth that would otherwise be lost. 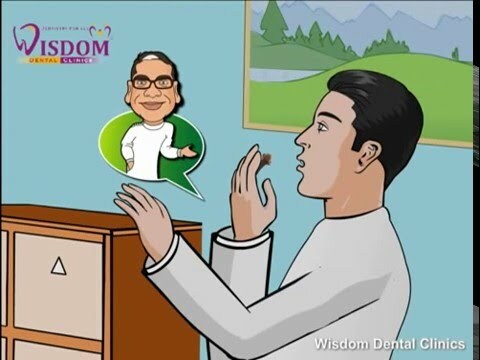 At Wisdom Dental Clinics over the years we have established & specialized in Single visit Root Canal Treatments, which gives less discomfort to patients as compared to conventional Root canal treatment (3 to 5 sittings). We complete a Root Canal Treatment efficiently in 30 min. A crown or cap is a tooth-shaped cover placed over a tooth that is badly damaged or decayed. Many people call it a cap. Crowns may be placed for several reasons. Usually the tooth has been broken or severely damaged by decay. As a result, a filling can’t replace enough of the tooth or make the tooth strong enough. A crown may hold together parts of a cracked tooth. It also can be used to hold a bridge in place. Crowns can be used to improve appearance as well. They may be placed to cover mis-shapen or badly discolored teeth.